The project required the construction of new buildings, in part reconstructing the form of the yards but in a contemporary form. The new facilities contain the restaurant, kitchens and retail areas extending the northeast side of the repaired and reconstructed adjacent Inn yard. The buildings reform the former lower yard as an external dining area. The restaurant is designed as a contemporary building closely referenced and well-mannered to its traditional setting. 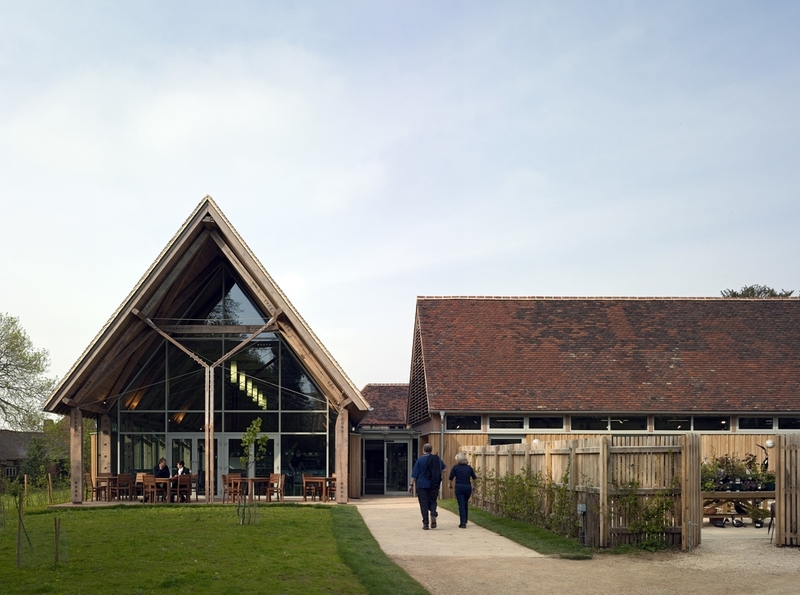 An innovative diagrid roof is constructed from larch timbers felled and seasoned at the start of the project from the NT Ashridge estate nearby. Structural bays support the main roof and contain lighting, services and acoustic treatments. Stainless steel ‘arms’ extend from the structural bays to hold the timber dia-grid roof above, leaving the walls almost entirely glazed to bring views of the landscaped park into the restaurant space. Visitors pass through the reception areas in the restored Inn range, beside the restaurant and out to the park, in an orchestrated route centred on the ‘Corinthian Arch’, to enhance interpretation. The retail building and plant sales area sit close to the entrance to the park. 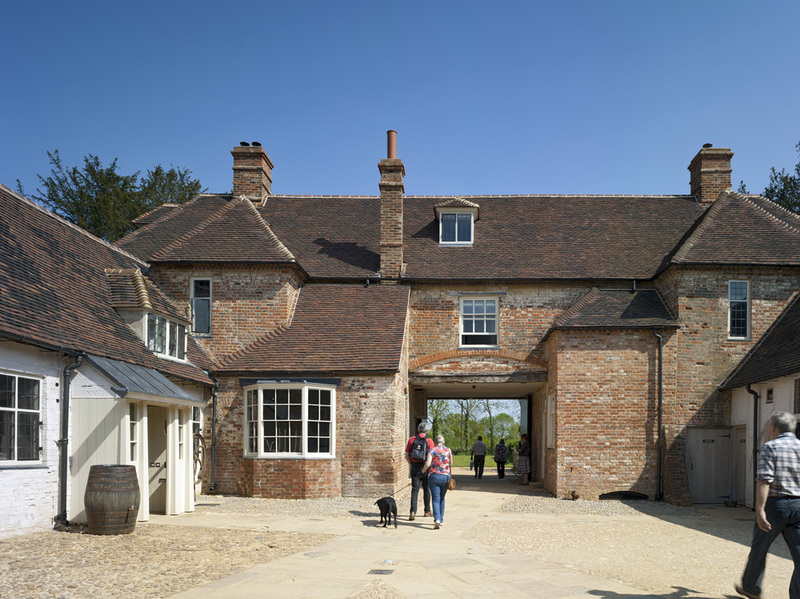 The New Inn contains Reception, an education room, parlour rooms and working areas restored to their C18 appearance, with lime plasters, historic finishes and restored fittings and joinery. New access roads lead to parking for 400 cars and coaches in a nearby former quarry, landscaped to conceal the vehicles from the distant park and Stowe mansion. A land train takes the less able visitors down to the Bell Gate and the gardens. A sustainable energy strategy forms a critical part of the project using a Biomass boiler fuelled from the Ashridge Estate to provide all the energy for the facility. The buildings consequently achieves a BREEAM ‘Good’ rating for sustainability, hard to achieve in a rural location. For a full description of the restoration of the New Inn please see ‘Conservation’.